Heat oven to 375°F. In 8-inch skillet, cook sausage, onion and bell pepper over medium heat 10 minutes, stirring frequently, until sausage is no longer pink; drain. Cool 10 minutes. Separate dough into 5 biscuits. On ungreased large cookie sheet, press each biscuit into 6-inch round. Top half of each round with sausage mixture and cheese to within 1/2 inch of edge. Fold dough over filling; press edges firmly with fork to seal. Bake 12 to 15 minutes or until golden brown. 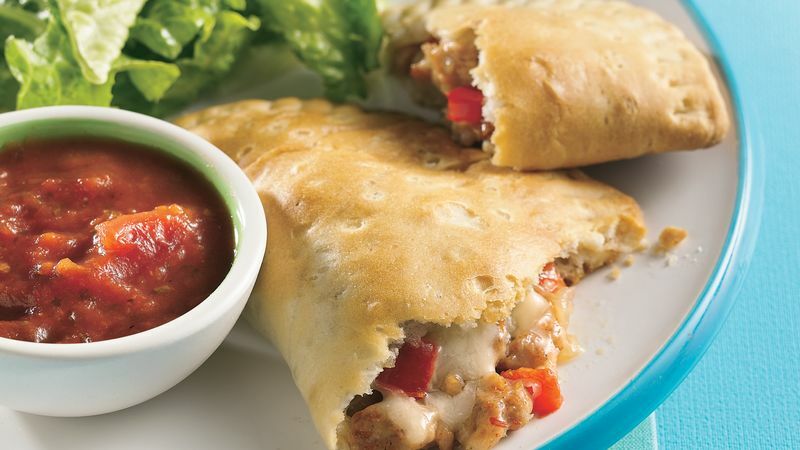 Serve warm calzones with warm pasta sauce for dipping. To reduce the fat in each serving by about 6 grams, substitute turkey sausage for the Italian sausage and use Grands!® reduced-fat buttermilk biscuits instead of the regular ones. The calzones can be assembled up to 2 hours ahead. Be sure the sausage filling is completely cooled before filling the dough. Cover the calzones and refrigerate until you're ready to bake them.